LANSA's Enterprise Resource Planning (ERP) software is an open source enterprise resource planning software solution for IBM i (System i, iSeries, AS/400). It is a comprehensive, enterprise-wide business solution with rich business functionality, an Executive Dashboard, Advanced Workflow, Desktop Integration, and flexible End User Queries and Reports – giving you the visibility you need to gain control and make educated business decisions. LANSA's IBM i enterprise resource planning software comes equipped with a complete business process integration and workflow engine enabling business transactions from any source or format to be automatically processed based on business priorities and needs. 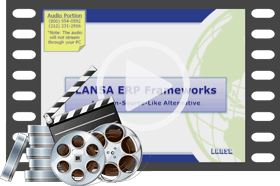 LANSA ERP Frameworks is built on our powerful metadata repository where business rules, triggers, data integrity, reusable components, and security are stored and managed. LANSA ERP Frameworks comes equipped with a complete business process integration and workflow engine. Other IBM i ERP software solutions require extensive consulting, expensive upgrades, high maintenance fees, and you fear whether you will ever get the desired functionality and ROI from a new ERP system. If you are looking for enterprise resource planning software for IBM i (System i, iSeries, AS/400) that is powerful, flexible, rich in functionality, and affordable, LANSA ERP Frameworks may be right for you. Each module is seamlessly integrated with related modules, contains transaction auditing, and includes reports necessary for monitoring your business and reporting to governing agencies. It is important to note that the modules are also designed to be able to be used independently. One of the benefits of this modular design is the ability to use one or more of the modules in a "best-of-breed" situation, using a module to replace or augment one segment of an existing system and then integrating it with the remaining segments. Since the modules of LANSA’s ERP Frameworks are 100% LANSA, you get the benefits of a proven system, rich in functionality, along with the flexibility to create a solution tailored to your business and easily modifiable to meet business requirements that are constantly changing and impacting your IBM i ERP system. Suppliers face many challenges today, including high levels of supply chain inefficiency, shrinking margins and escalating customer expectations. It is more important than ever before to increase productivity and profitability, enhance the customer experience and establish a virtual enterprise. All of this is possible through effective use of technology. A key component of LANSA's ERP software solution is the Distribution Framework offering core application modules to address critical business requirements, with the advantage that they can be easily tailored to meet an organization's unique needs and can be extended to provide web, Windows and XML interfaces using LANSA's advanced software. Manufacturers are under increasing pressure to lower costs, improve customer service, shrink the sourcing cycle and maintain velocity supply chain management. It is imperative to integrate information silos and processes within the enterprise and with all points along the supply chain (suppliers, outsource manufacturing sites and customers) in order to satisfy these requirements. Another key component of LANSA's ERP software solution is the Manufacturing Framework offering core application modules to deliver a fully integrated base system, with the advantage that this base can then be easily tailored to meet an organization's unique needs and extended to address trading partner integration through web browser self-service applications and application-to-application integration using LANSA's advanced software. It's true that a better Accounts Payable system, General Ledger application, or financial reporting system will not generally lead to better customer satisfaction and retention - or improve your ability to adapt as circumstances change in your supply chain. However, a well integrated, soft parameter-driven financial system does increase your administrative and finance department’s productivity - and is invaluable in allowing you to get the accurate big picture view needed without waiting for a lengthy month-end process. LANSA's Financial Framework – a strategic component of LANSA's ERP software solution – offers core application modules that include multi-currency, multi-level tax processing and multi-company capabilities. The ability to implement procedural changes as business circumstances dictate is driven primarily by soft parameter changes rather than coding/development changes. In addition to meeting your organization's unique business processing needs, the Financial Framework can be extended to provide web, Windows, XML and EDI interfaces using LANSA's advanced software. CodeStart solutions, frameworks and modules are licensed on an as-is basis with the source code included. There are no warranty or ongoing software maintenance fees or upgrades for these solutions. However, LANSA Professional Services provides implementation and technical support for the CodeStart solutions on a billable time and material basis. Jay Kamradt, Assistant Manager, Information Systems at Kawasaki Motors Manufacturing Corp. U.S.A.